Phil Warren leads Belgian horses Tom and Jerry, pulling a wagon full of Billings Farm visitors. The ride is part of a weekend that highlights Vermont’s rural heritage. Nov. 1, 2 — WOODSTOCK — Billings Farm & Museum, gateway to Vermont’s rural heritage, will feature Wagon Ride Weekends each Saturday and Sunday in November, 10 a.m. to 4 p.m., beginning Nov. 1. 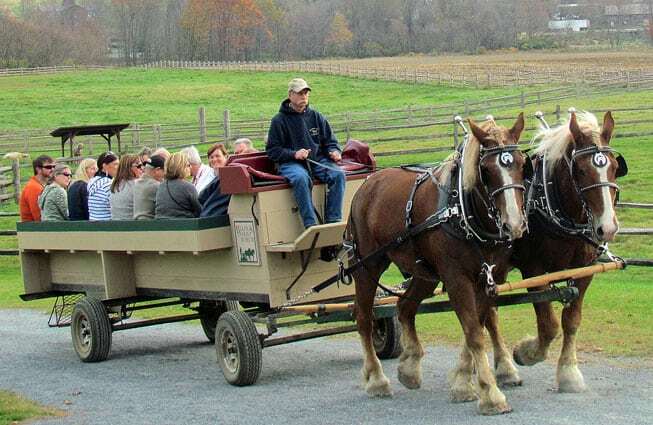 Board the farm wagon pulled by a team of draft horses for a brisk ride around the farm. Rides will be offered from 10:30 a.m. to 3:30 p.m. each day; an Introduction to Milking and Milking the Herd programs are scheduled for 3:15 p.m. The final weekend of the month, learn about late 19th century Thanksgiving traditions as the Farm & Museum celebrates Thanksgiving Weekend, Friday through Sunday, Nov. 27 – 29, from 10 a.m. to 4 p.m. The event will feature costumed guides demonstrating cooking traditional Thanksgiving fare in the farmhouse, holiday programs, milking the herd, and includes horse-drawn wagon rides. The operating dairy farm, farm life exhibits, and the restored and furnished farmhouse – plus programs and activities are included in the entrance fee. The Farm & Museum is located one-half mile north of the Woodstock village green on Vermont Route 12. For more info, call 802-457-2355 or www.billingsfarm.org.